Roots abundant, rather fleshy, glabrous. Very short stem, appearing thick, completely enclosed by conduplicate bases of leaves. 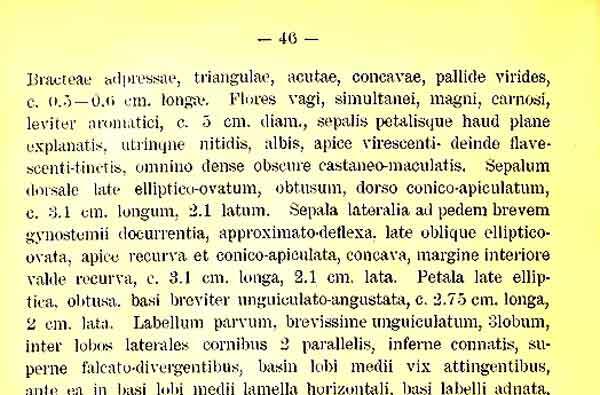 Abundant foliage (5/6 leaves naturally), leaves very broad, pendulous, coriaces, brilliant on the two faces, oblong-ovate or elliptic, rounded, exceeding 50 cm long on 20 cm. wide. Flower stalk, thick, pendulous carrying many flowers, seldom ramified, being able to exceed 40 cm. Bracts triangular, acute, concave, from 5 to 6 mm. Flowers fleshy of 5 cm, slightly scented. Dorsal sepal spread out, elliptic or ovate-elliptic, obtuse. 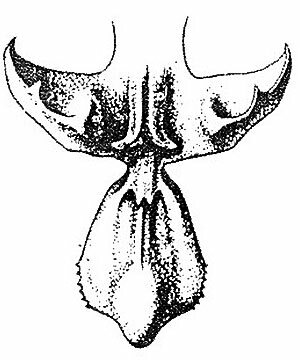 Lateral sepals fleshy, well spread out , obliquely elliptic or ovate-elliptic, obtuse, at base adherent with the column foot. Petals elliptic or rhomboid-elliptic, acute or obtuse. Lip 3-lobed, 3 times smaller than the sepals, fleshy. Lateral lobes triangular, sub-falcate, with a flattened callus towards the center. Midlobe ovate or ovate-sub-rhomboid, toothed on the side edges, with an ovoid callus at apex. Provided at the junction of lateral lobes of a bidentate fleshy callus, continued by a hull. Disc between the lateral lobes provided of a sub-cylindrical fleshy callus whose apex is forked in two sickle-shaped parts. 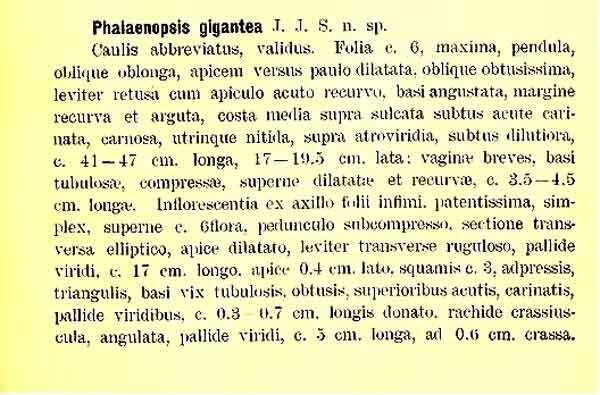 Column short, fleshy, white, cylindrical, dilated at the base, exceeding 11 mm. Pedicellate ovary of 25 mm. 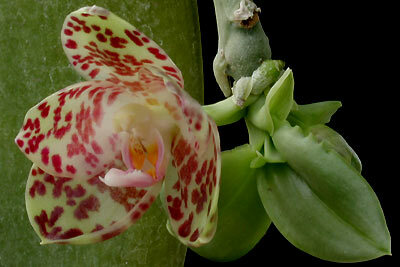 The colors are rather variable and the flowers very delicately scented. 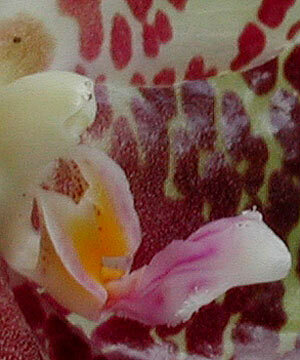 The color varies from white to cream and yellow or yellow-greenish, more clearly at the base of the sepals and petals. 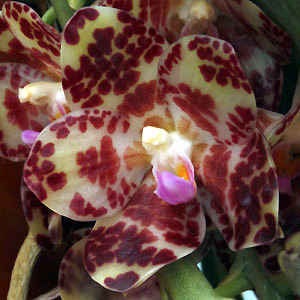 The floral segments are decorated with concentric bars and spots , sometimes very dense, brown/red, chestnut, purple or violet/brown. White lip often striated with three magenta lines on each side of the keel of the midlobe. The lateral lobes have orange callus and the higher half of each one is yellow/orange, spotted of magenta. The junction of the three lobes can be magenta. The callus which decorates the disc located between the lateral lobes is orange. 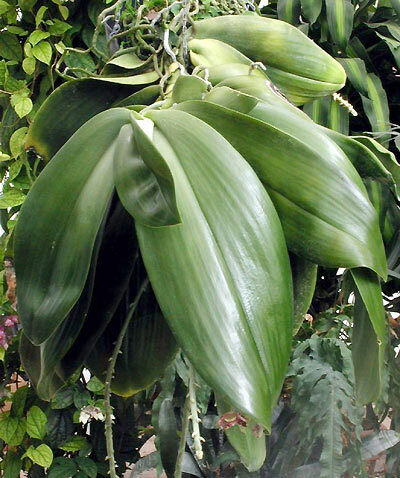 Phalaenopsis gigantea produces the bulkiest plants of the kind. He his know localy in Borneo has 'elephant ears'. Flowering was observed all the year. It is more frequent in spring and autumn. 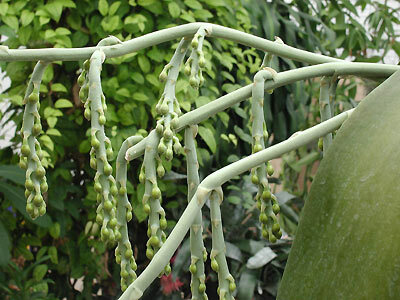 Under good conditions, the plant often produces several stalks simultaneously, carrying each one from 20 to 30 very tight flowers. One defers a specimen having given a stem carrying 70 flowers. Considered difficult in culture. 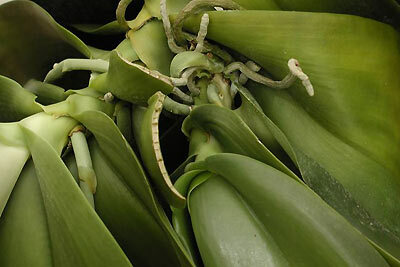 In all the cases the growth is very slow and the plant appears to appreciate only moderately the sun according to some whereas other lavish the same light as to him Cattleya. The latter seem to be right because Phalaenopsis gigantea is reported to be growing in the high part of tropical forest and the foliage is completely resistant to a luminosity which one could describe as excessive for an other Phalaenopsis. One meets it up to 400 meters of altitude. A widespread idea wants that it is necessary between 8 and 12 years of culture to make flower plants from seedling. In practice, four years are enough with good conditions of culture. Flowering intervenes then on plants relatively little developed, of less than thirty centimetres of scale. With a lighting ranging between 3000 et 7000 lux, the plant do not flower but develop large-sized and spectacular leaves slowly. 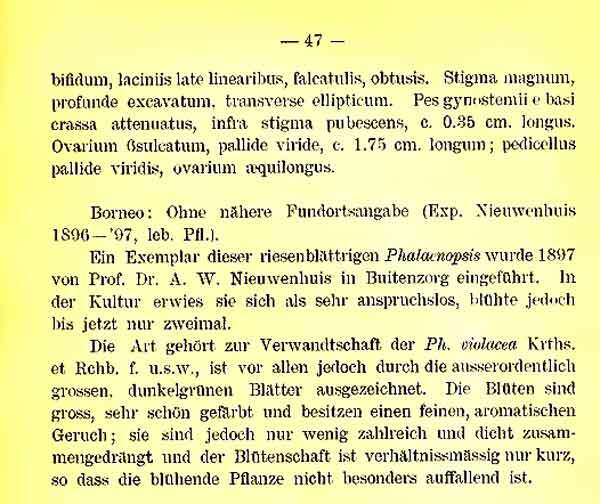 Collected for the first time in 1897 by Niewenhuis, botanist of the mission supervising the border enters the Dutchman part of Borneo (now Kalimatan, Indonesia) and the British part to north (Sabah in Malaysia). He was confused then with Phalaenopsis amabilis and was brought back to Buitenzorg (Bogor), or he showed a plant with the very slow growth. He flowers nevertheless in 1909 and J.J.Smith then directing of the garden described it. A few times after its description this plant died. This species appear whereas of intermitente manner and dubious until 1937 when it was rediscovery at the time of the opening of a road in the tropical forest. 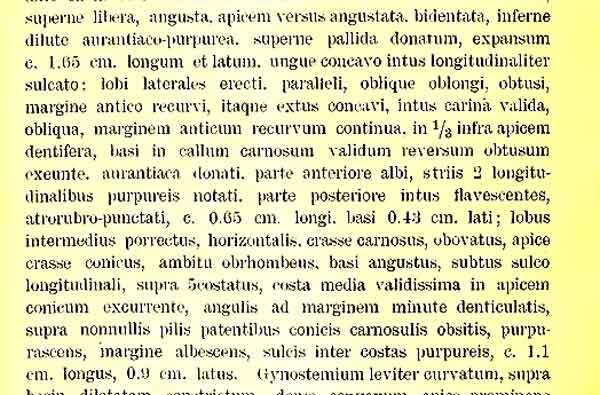 Certain specimen were measured at this time with leaves of 90 cm. of length on 40 cm. of broad. Currently, this specie is become again untraceable in the known sites, i.e. on the slopes of the mountains Batukelau and Kumbumesaai, along the rivers Mahakam in Samarinda, and on the slopes of the Lumbis mountain along the rivers Sembakung in Tarakan.